I am not sure if anyone noticed my absence from TAFE today, but since I have all my projects completed (as far as I know) I am working on some Materials Studies and Context and Culture of my own. I will be in the painting room upstairs on Friday morning to work on the portrait some have seen me struggling with! Started sorting paintings to go to Moodi’s Cafe in Pearcedale to replace the ones that I have had there for the past season. This is all apart from the personal stuff of weeding in the garden, tidying our cottage, doing dishes, putting out 3 loads of washing, washing my car (shocking I know! ), checking livestock, cleaning out the carport, responding to email etc (and its only 2pm!). Later today came grocery shopping, visit to local nursery for some new plants, dropping off paintings at cafe, petrol for mowers, putting away washing and then I get a bit of rest to watch 2 art programs I recorded this week. Thursday morning I have a training session at McClelland Gallery for volunteers, which is always fun – apart from the fact that they supply free coffees for us! Friday night I will be at Walker Street Gallery for the art exhibition with hubbie. I am very keen to see what the advanced diploma students have produced! Saturday afternoon I will be at McClelland Guild of Artists for the last monthly demo of the year. The theme is landscape (rural) so I am taking one of my oil paintings to be judged – we will see what the demonstrating artist makes of it. Monday night is the last demonstration for the pastel society for the year, which I get a lift to with an artist friend. Always a very good night. The professional members will be doing an assessment and appraisal evening (I was not asked so will not be doing this) for anyone wanting to bring a pastel artwork along. I haven’t decided whether to participate – as in bring an artwork to be appraised, or just watch and listen for this one. Today we had the final Research and Analysis class for the year 2012. A small and select group of dedicated students arrived to an unfortunately unwell tutor who had stayed long enough to make sure we had the topics covered for either discussion or in my case, blogging. Thank you David. You have been a champion tutor all year and I have enjoyed not only learning from you but also getting to know you a little as well. Getting on with the topics at hand: Rationale for inclusion of an art analysis/history type subject. Review of some themes covered, which ones are memorable. My most memorable topics were firstly Margaret Ollie. I didn’t know much about her at all before this year. I found great inspiration from her story. I also enjoyed the video about Vermeer, his use of light was amazing. I also liked having the chance to really think about my choice of style and method in painting, my plans for my practice and direction for the next two years at least. Being made more aware of living and past artists, their life choices and careers allows for reflection about what I am doing and where I am going with more planning and forethought. What discernible changes have you noticed (if any) regarding how you view your own artwork? I think I have become a little less critical and self doubting this year. I can allow myself to experiment and make mistakes or allow things to take their own direction a little more. I am starting to analyse my own work more like I would someone else’s with a bit more detachment and clarity and less negative emotional input. Not every work has to be perfect, all my work is a journey. In what way has your development been clarified as well as your sense of direction? During the year I have only become more determined to follow the direction I have started on. I enjoy painting and drawing in a realist/impressionist mix style. It wavers a little more toward one or the other depending on the subject and medium and how I want to represent them. I am allowing myself to experiment with areas outside of these to help with development of creativity and keep the enjoyment of the production of artworks but I am very happy with the improvement in not only method but also clarity to produce artworks efficiently for a commercial venture. Has the experience of art school made you freer or more restricted in your personal expression? Even though I am zeroing in on my own particular style and mediums this has not been a year of restrictions. I admit there have been a few exhibitions we have attended that I could have done without. Confronting art is really not my thing, especially given my life experiences. Apart from these, the discussions, videos, artists talks and practical study have all worked towards broadening my horizons, making me think more deeply about what I am doing and why, pushed me to do that little bit better and pointed out areas where I have worked hard to improve my skill levels. Networking with other students and discussing the progress of a drawing or painting with tutors is an experience I have not had for a long time and it has been inspirational and fun. Fellow artists in a couple of art guilds of which I am a member, as well as my husband have noticed an improvement in my skill level this year. I have had some amazing comments about works presented at guild meetings and have noticed my efficiency and ability to construct work has improved dramatically. I am also becoming more confident in groups. Along with my volunteer work with the educational department at McClelland Gallery I have noticed an improvement in ease and confidence in front of groups to talk about art and instruct. Overall it has been a wonderful year. I could not have asked for better tutors. I especially want to point out my Painting, Drawing and Research and Analysis classes as being very productive and my Digital class for bringing back the enjoyment and creativity in front of my Mac. Thank you everyone. I am already looking forward to next year and can’t wait! I am pleased to offer the opportunity to enjoy learning the basics of drawing over the summer break 2012-13. Classes can be made up of small groups or individuals who are interested in a relaxed and easy way of learning some of the basics. These can be in your own home, in your premises or club rooms during evenings or weekends to suit your timetable. If you have an interest in graphite (pencil), charcoal or pastel drawing here is your chance to give it a try under the instruction of a Certificate IV trained instructor who is a practising professional fine artist. Groups of 6-8 students are an ideal way of enjoying these lessons and workshops at an affordable rate. Ages from 10 to mature age are accepted. Children under the age of 16 must be under supervision of a parent or guardian during the class. A 9 week course is available for those interested in a more structured course and a 10% discount is offered to those who wish to pay in advance. Course notes are supplied as well as some of the materials required for the 9 week course. Please contact Janice Mills for a leaflet with pricing for your lesson/workshop requirements. No verbal prices or estimates will be given on the phone. Payments via EFTPOS, VISA and cheque can be made when arranging your confirmed bookings. 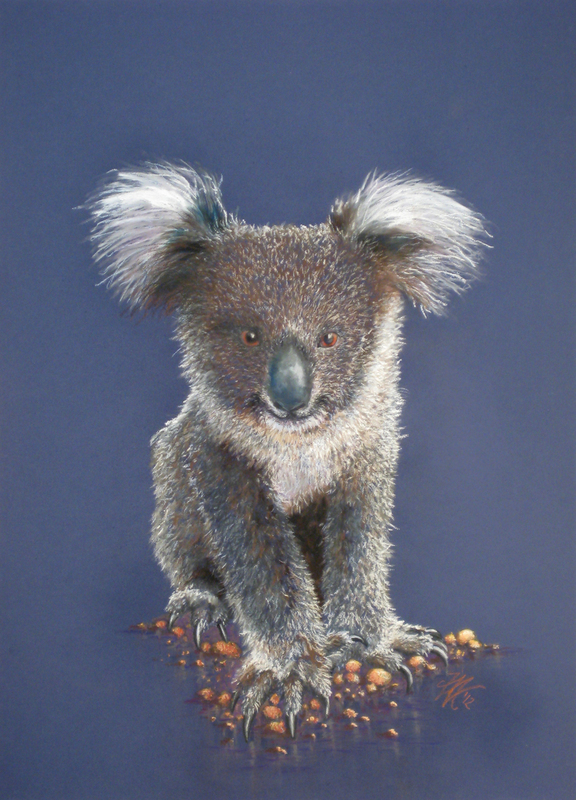 I was pleased to be advised over the recent weekend that my pastel drawing of a koala had been awarded a Highly Commended at the annual exhibition for the pastel society. This society is full of extraordinary artists. Many are professionals who regularly teach and demonstrate at various art groups around the country. Most have been practising for many years. With this in mind, I think that that I am coming along nicely in my plans to do similarly for my career. The judge for the event this year was a very qualified and well known art expert so to receive a highly commended is a good result. My next big exhibition will be the AGRA Summer Exhibition in January 2013 and I have a work ready for that so am looking forward to participating. Meanwhile I am posting my little koala for all to see the artwork that gained this achievement for me. Charlie Tong was an engineer in China and began painting when he moved to Australia. He has entered art shows frequently since 2002 and won many major prizes at shows. Charlie has worked as a full-time artist since 2003 and has been conducting workshops and doing demonstrations around Melbourne area. For the Berwick demonstration Charlie was asked to paint an animal in oils. Animals are amongst his favourite subjects and for this session he chose to paint a horse in action. The surface was a primed 1.2 x 1 metre particle board and Charlie had only about four colours on his very large palette along with white. He was also using very large house painting brushes to allow for the very broad and loose strokes he likes to use for his impressionist/abstract style of painting. As a painter and drawer of animals I liked seeing his preliminary drawings, where he got into the form and movement of the horse so he could create a believable painting. It was with the biggest of these brushes that Charlie began blocking in his board. using dark grey/blue. I recognised the familiar dividing up of the proportions of a horse’s body straight away. Simply put for a general rule, the horse can be measured out using the head size. A head measurement can be used for the neck, shoulder, body depth, rump, leg to knee, knee to foot. Individual breeds differ of course but this is an easy way to start off any drawing for a horse. Charlie’s style of painting is very impressionistic bordering on abstract so he built up the image by cutting into the background colour allowing the subject to gradually emerge. He also used some colours not on everyone’s palette for animals. The horse was to be white but to show mid tones and shadows blues, greens and reds were used. When considering tonal values, really the colour is of no importance for an artwork, as long as you get the tonal values right. This is where you can differ from a direct copy from nature and create your own interpretation. The nice big marks and different rendering of the horse gave me some great new ideas about how I approach painting animals for something different I can do for my own work. the hind legs were allowed to merge in with the surrounding colour giving the impression of swift movement and life to the horse and there were not a lot of hard edges. Stay loose and large as long as possible and work thin to thick were also traditional methods that Charlie talked about, so no matter how you paint, some of these principles still apply. After the break, I was expecting to see the horse refined to a complete painting, unfortunately, charlie had decided to change subject matter and began painting over the horse to show us how to paint portraits and the human face. The horse quickly disappeared. “It’s still in my head” he said. I was sad that it wasn’t on the canvas. The instruction was very good but it did drift off topic. By painting over a work he had just spent an hour or so on, Charlie showed yet again not to be precious about our work. If you are not happy with it, or you have a better idea, paint over it. It is just paint and canvas. I also have some great new ideas about trying out a looser and broader method of painting. My style – but a bit more impressionistic and a little more painterly. I am thinking that should be fun. Bulgarian-born Christo Vladimirov Javacheff came into the world on June 13, 1935 into a Bulgarian industrialist family. He studied art at the Fine Arts Academy, Sofia, Bulgaria and worked with his partner American, French-born Jeanne-Claude Marie Denat, (June 13, 1935, Casablanca educated University of Tunis) until her death in November 18, 2009 in New York City. He has continued to work on his projects to this day. After seeing them working together in the video today I was sad to see Christo’s web site with photos of him working on his latest projects alone in his studio. His life seems to have skipped by so quickly when viewed in an afternoon. Furiously working and planning with Jeanne next to him one hour and alone and nearly forty years older only a little later for me. I guess the positive thing about it is that he is still working, still planning and looks still totally enthused by his art. I can only hope that I have that to look forward to no matter what life throws my way. I am drifting off topic a bit here, sorry about that. We watched a video about the The Valley Curtain Project. Completed in about 1972 in the United States, this type of project was still very new. It was interesting to see the reactions of people not only working on it but watching its progress. As with all of Christo’s work that I have seen it is massive. The planning and project management for such a large piece would be enormous, not to mention getting the funding. I think a lot of the infrastructure that goes behind large art projects in particular may be overlooked and it is good to see how many people are involved and how much work goes into them. 1400 square metres of cloth was used for the “curtain” and the project came in at approximately $400,000, which in the early 70s was a huge amount of money (more like millions today). It was discussed that Christo enjoyed the installation process more than the design and planning. I wondered whether it was all the collaboration with others that made it that way rather than just seeing the whole thing come together, or maybe a combination of the two. No matter what it was, we had a good discussion about why he does what he does, why he may use the materials he chooses and what we can take away from each event. Since these artworks/installations are all temporary (the curtain only staying up for about 28 hours) why go to all the bother? Why create art that is not meant to last? These can lead to really big questions about the temporary state of our lives and humanity, or even the physical realm. We are all dust, we are all only here for a short time. Even the sun will burn out one day, the universe began and it will most likely end so why create all our art with the goal of making it as long lasting as we can? We create art to enjoy the journey, maybe sometimes it is good to appreciate art the same way. The experience and the journey put away in our memory palaces whilst the art is allowed to disappear. I remember Ian as the guy who got on a leaky raft and tried to float across the Timor Sea to Indonesia. I probably amongst others at the time thought he had a few ‘roos loose in his top paddock as he nearly died in the effort. But I am not here to go on about his eccentricities as much as his devotion to and skill as an artist. “Ian Fairweather was an Australian painter. Fairweather was born in Scotland in 1891 and arrived in Melbourne in February 1934. He is considered one of the greatest Australian painters of all time, combining western and Asian influences in his work.” He died in May 1974 on Bribie Island, Queensland, Australia. Many may remember Ian also as the hermit like artist who lived in a makeshift hut on Bribie Island in Queensland. He lived there until his death mostly in very basic conditions until he was given a more permanent building which took him years to move into, as he didn’t like it at all. Ian seems to have been a lone soul for most of his life, starting with is childhood in the care of aunts then in the Jersey Islands wandering around teaching himself to draw and paint. Later in life he joined the army and served in WW1, not the best place for a character likes his. He spent 4 years as a POW and he seems to have thrived better there than actually serving. During the 1920s he attended the Slade School of Drawing and his skills excelled. After this he spent a lot of years not being settled in any one place. He went from one country to another learning more skills along the way. He was very influenced by Asian art in China as well as Bali and felt very at home with their different treatment and attitudes to artists as part of their society. When eventually arriving and living in Australia, I think he felt so constricted by the very western and conforming nature of life especially in Melbourne at the time that he was unable to cope. After another bout of travelling and more military service in India he was back in Australia. In Melbourne he was still not happy, proven by taking on a project which he abandoned only to flee the state. Ian really found himself and became the artist he wanted to be on Bribie Island. The solitude and the surrounding animals and bushland allowed him to do what he wanted, to paint. This is where all his experiences and his observation of his surroundings came out in a huge amount of artworks. It is just sad that he painted with such poor materials and he packed them so badly for shipment to exhibitions that we have little of them surviving now intact. I am not sure if Ian really understood how influential his art was to many other artist at the time or those who came later. His work became very collectable and was of major interest not only in Australia but also overseas. As Bribie Island was connected to the mainland and people began living closer and the tourists came along this affected Ian along with ageing and his health deteriorating. Along the way he lost the will and the spark to paint which I suspect was the beginning of his end. A solitary man with a devine spark in his eyes and a wonder about the natural world around him, I can understand his inability to cope with humanity and his desire to paint in peace. The main message I took from his words were from a question he was asked. I have to say that I am finding that a lot of contemporary art just leaves me cold. I can’t really relate to it and emotionally can not find a connection. Technically, sometimes I may find something interesting but more often than not I find myself thinking “how the hell did anyone manage to get this into a gallery?” or worse, “what a piece of crap”. This is no doubt going to cause a few raised eyebrows or tut tuts but really, am I supposed to give my honest opinions here or not? OK I will try for some positive comments. I likes Sally Smart’s “Exquisite Pirate” not only interesting but a clever use of used materials and very creative, even though I didn’t see any of the “deep and meaningful” as depicted in the accompanying text. The use of colour was clever in “I’m Not Sorry” even though as usual, the whole premiss of the sorry business with ex prime minister Howard to me is misunderstood through lack of understanding of litigation law colours and again retells a misleading story. Anyway, I am going off topic a bit again. Vernon Ahkee’s self portrait I think I liked the most. It was done with mostly line work and was very expressive. The face had heaps of character and I loved looking at all the mark making. In black and white and only using pencil lifework is like going back to basics but gave room for the image to gain a life of it’s own. Peter Graham’s painting “When the Desert Blooms” was beautiful. I loved the soft colours and the intricate patterns that flowed around the painting. It was the type of work I could sit and appreciate for quite a while. Janet Lawrence’s “Botanical Residues” were architectural patterns on clear panes of overlapping perspex. I liked the new forms created by the light going through the forms and panels and the creative use of the materials. Bill had 66 pieces on display and was very clever is his use of materials making them all the same size. It the room he had, this made for an interesting uniform and “tidy” look not taking away from the creativity he had put into each piece. As you looked around the room the artworks looked like they were set into about six or seven themes with about six to ten works for each. Bill gave a fun and interesting chat about his process which we all enjoyed very much. He very much likes to react to what happens with the materials and follow a creative path from the initial application of things like a puddle of paint on the paper. It leaves the resultant very expressive and sometimes a little strange view of Bill’s imagination and world. Cathy has a great eye for perspective. Her themes of buildings and interiors are very well thought out and have a huge amount of detail. She works very hard on her paintings and the colours and depth are very striking. Her work is not really realism as they are not truly tonal, but the textures and use of colour perspective make works that you feel you could walk into. Cathy also gave an interesting chat about how she approaches her work and exhibiting. Nothing like a person talking about the book of Revelation that obviously doesn’t know what’s in it. That was my first introduction at the NGV. Um what were the colours of the other two horses of the four horsemen… Oh give me a break I thought, then blurted out PALE AND WHITE! I made a hasty retreat before I started correcting the rest of her talk to the increasingly frightened Asian crowd, who I think will now never convert to Christianity. Hell and damnation will do that to some. OK drifting off again. Durer and Goya were the main reasons for the visit for me. Both masters of their craft, it was a joy to see their intricate etchings and wood cuts. Although the subjects were of stories from one of the most misunderstood and possibly scariest books of the Bible, in many there is beauty if you look for it, and in all there is the masterful use of the materials. For those interested in aquatint, etching and wood cuts, you can’t go past these guys. An additional thing for me at this exhibition were the beautifully preserved books and illustrations in them. I have read enough of Revelation to know that it all works out in the end. The bad guy gets punished, the good are rewarded and the universe and the world are renewed. For me it is a story of warnings, what could happen if humans keep fighting and misusing the planet we have been give to live on, if we learn, we can avoid the whole thing, if not, we may have hope anyway in a saviour. The artworks only reflect how at some point in time people struggled to make some sense of this book and what it meant and how it was used by some as one means in many to control the population. I spent a lot of the day in the company of some very special students that I have the pleasure of having coffee with most mornings. Sue and I made a day of it having lunch with a drop of wine and doing a lot of chatting. The train trip was very enjoyable in both directions even with the deter onto busses for a bit of the return trip because of a death on the tracks. I refused to let anything take away from the pleasure of the company and having a day out to explore art that wasn’t too icky or confronting. We even called into a few other galleries on our walk from one event to another to peek at some different styles which was also great fun. My thanks to my partners in crime today for putting up with me chattering away and sneaking off with me to the hatters under Flinders Street Station for that Fedora that I have wanted for years! During the last semester in painting class my tutor Jon wanted to show me a colour to mix for a shadow in a still life I was completing with his guidance. I hadn’t noticed how I had neglected my paint tubes until I saw him struggling with one of them! Ooops I thought, He can’t open it, and when he did he couldn’t get the paint out! Hugely embarrassing. I promised him that I would go through my paints at the first opportunity and clean up. Which I did today. Everything came out of the painting kit and I have even done a stock take for new colours I need, which thank goodness is only a few as I will now be mixing a lot more after having such good guidance on that this year. Anyway, I digress. Each messy tube has been opened, some with difficulty, and the lids and tops cleaned, the paint all moved to the tops of the tubes and I have made sure you can get paint out of every single one of them! I must say at this point that in some ways going through all these paints was a trip down memory lane. I read the labels on some and realised I had bought them over thirty five years ago! The old Winsor and Newtons had no safety labels or anything on them and I know I used them in my late teens. Wow get good paint and it REALLY LASTS!!! Back to the cleaning bit – I have a newer rag in the kit, replaced my old turps bottle for rinsing brushes and have a “new” palette of sorts. It is actually a tray for an oven but it fits into the kit and is bigger than the last one so I am happy. Monday will include a trip to Seniors to replenish stocks and I will be ready for a great summer of painting and for next year’s painting studies. I am planning on making painting my major for year 2 of visual arts so am really looking forward to my next step. In finishing, it only took a disapproving look from my tutor to push me into action to fix what I should never have let happen, so thanks Jon. I have kept my promise and will “try” not to let my paint tubes get into such bad shape again! I attended the opening of the exhibition at Walker Street last night, invited by Peter Biram. Peter gave a full day drawing workshop at Chisholm Frankston earlier this year and also a very entertaining and informative artist talk a few months later. He is not only a talented artist but also a passionate believer in the value of our natural resources and heritage. The Environmental Expressionist “movement” of which he is a major contributor is dedicated to artists of all types presenting the world with a new view of how humans can live and work co-operatively and sensitively with the natural world in a way that makes sure that it is preserved and protected. What I like about their approach is that it is not a confrontational movement. The artworks are beautiful, the poetry very moving and the whole attitude is very positive. Rather than presenting what could be ugly, painful or disturbing I saw colour, vibrancy, joy and creativity. I believe that we can lead by good example, show what is or could be positive and bring out the best in human nature with our artistic endeavours and I saw that in every piece at this exhibition. Peter’s work, especially his latest artworks, are beautiful. He has designed works that include the use of LED lights incorporated into his paintings that means that when the lights are lowered you gain a whole new perspective on them and they create a wonderful effect that is almost hypnotic. I found that wonderful, art that speaks to you in nearly any lighting situation! Peter has a good selection of his works on display at the Walker Street Gallery and all are just breath-taking (and for sale). They are mostly large pieces, although I did find a few miniatures, one using his new LED idea, which were some of my favourites. I encourage all of my fellow students at Chisholm to take the time to call in and see Peter’s exhibition and show support for his growing Environmental Expressionists group. As a semi-rural resident who loves my local wildlife and the natural surroundings we are lucky enough to have in Australia I think that we can all help to further Peter’s cause, make it our own in some small way in our art practices; and help make Australia an even better place for future generations.